It has been six months in gestation – planning, preparing, pondering, praying, pleading and protesting (not necessarily in that order). And here, at last, it is. You are most welcome to His Grace’s vibrant new blog – a lively place of religio-political discussion, with added chat, fellowship, cyber-coffee and prayer. The intersection between politics and religion in the UK has become increasingly fraught over recent years, and this blog has been at the forefront of debate. As we see the travails of religious belief becoming as globally significant as political ideology, we are incrementally subjugating freedom of religion to an immutable secular orthodoxy, under the sinister guise of “neutrality”. It is hoped that the community who gather here might not only rail against the irritating, bothersome and loathsome, but also occasionally enlighten, guide, correct and rebuke (in love), and also pray daily for one another; for friends, family and community; and for all those in authority. 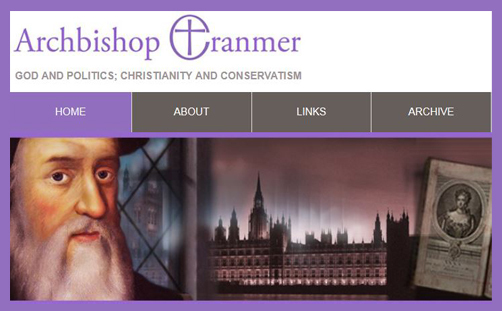 The Archbishop Cranmer blog has come a long way since its inception in 2006 – from a timid half-dozen who used to comment in the earliest months to a robust readership now over 100,000 every month. There have been in excess of five million visitors to the blog since it launched, coming from 175 separate countries (some of them very surprising indeed). But times change and technology move on, and here we are on a whole new platform. To comment, you will need to open a Disqus account (via Facebook or Twitter, if you prefer: it’s the most effective way of dealing with abuse and mitigating spam). There will be one or two glitches as we move ahead over the coming weeks (we are aware of a few browser compatibility problems), so please bear with us. Some of the chronic tensions between thinking as a 16th-century cleric and writing as a 21st-century academic were irreconcilable: the politics did not always cohere with the faith, and the religion was occasionally nullified by the politics. Sometimes the anachronisms were maddening, and occasionally the medium hindered the message. The stresses in some senses had become unbearable – especially with the number of media and speaking invitations His Grace was receiving (and obviously, being ash, unable to accept). This blog has therefore not only engaged the services of an Editor – Adrian Hilton – but also a Deputy Editor – Gillan Scott – who was the author of the very successful and highly respected blog God & Politics in the UK (see About). He is closing that blog and joining His Grace permanently – not so much corporate takeover as a friendly acquisition or ecumenical merger. You won’t always agree with the content here, and neither will they always agree with each other: it might even become a “good cop/bad cop” interrogation of religion, politics, theology and philosophy. But in this postmodern age, so often typified by the fracturing of faith and the fragmentation of fellowship, this partnership promises to take Archbishop Cranmer from strength to strength, to be salt of the earth and a light in the world, to preach the Word in season and out, to glorify the Name of Jesus. Thank you for visiting, reading and participating. Now, where to begin..